The *amazing* 100 LED flashlight! So, we had a family Christmas party last night, which is always a good time. A few years back, however, we migrated to a “drawing someone’s name” method for gift buying, primarily so that the spending could be somewhat contained. Rather than purchasing small, lame presents for everyone, we purchase nicer gifts for one specific person. It’s cheaper for everyone, and you actually get some stuff that you want! Anyhow, one of the items on my list was the “100 LED Flashlight” from Geeks.com. I have a thing about flashlights, and I’m not entirely sure why. There’s just something about a flashlight that looks like a portable showerhead, but has the brightness rating of a small star! I had to have it, and thusly it fell into my possession. Thankfully, my Dad was clever enough to purchase the (required) 4AA batteries, so I was able to fire it up right then and there, much to the amazement of everyone present. Honestly, it is blindingly bright! One of the best parts about getting these “straight outta China”-type items has to be the packaging. You see, although many of the items we purchase here in America are “Made In China”, they are typically still filtered through an American company that handles the design (in some cases), the marketing, the packaging, and so forth. Heck! 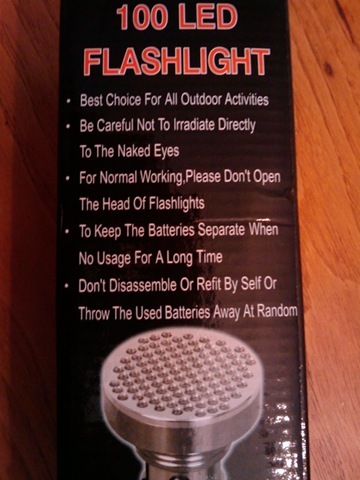 Half the fun is the ‘engrish’ on the packaging for these items! Case in point, the “100 LED Flashlight”.